"Time Warner Should Buy Starbucks"? I just discovered a wonderful marketing blog written by a fellow named Bill Gammell. 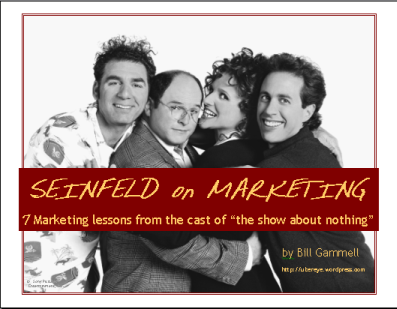 Bill works in the marketing department of a market research company out in Utah and, among other things, has written a series of posts about marketing lessons learned from the old Seinfeld TV show.